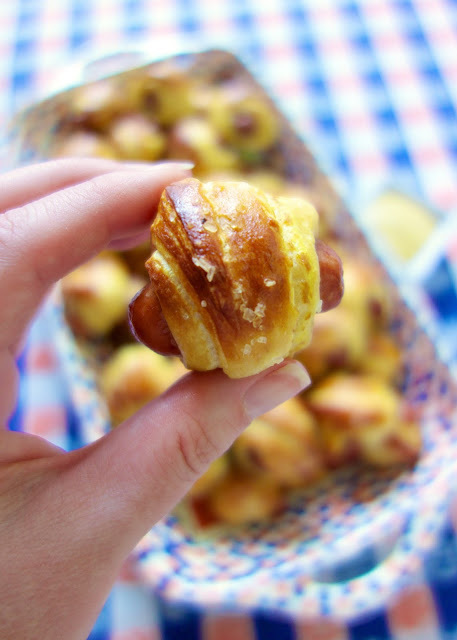 Pretzel Pigs in a Blanket - transform refrigerated crescent rolls into a delicious snack! These are SO easy and SO addictive! You can't eat just one! Great for parties and tailgating. Everyone LOVES this easy appetizer recipe! 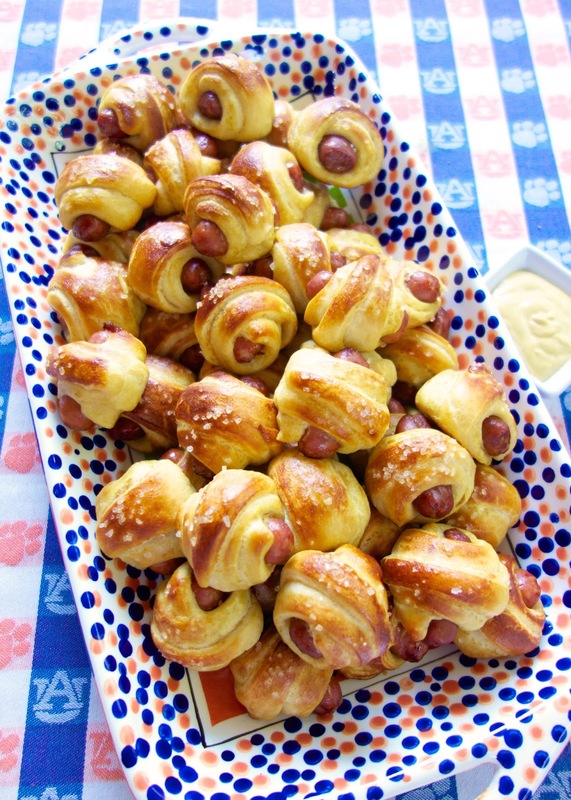 It's championship weekend in college football, and these Pretzel Pigs in a Blanket will be on our tailgating menu! These little piggies are my kryptonite. I can not control myself around them! I just keep popping them in my mouth. *oink* *oink* They are SOOOO good! I could seriously make a meal out of them. These Pretzel Pigs in a Blanket use refrigerated crescent rolls for the dough. The assembled pigs take a quick bath in a baking soda and water mixture before going in the oven. The baking soda and water mixture is what gives them the pretzel texture. Such a quick and simple step to transform our usual pigs in a blanket into something amazing! In a large pot, combine 10 cups water and baking soda. Bring to a boil. Place sausage on wide side of each triangle. Roll up. Using tongs or a strainer, dip each wrapped sausage into boiling water for 5-7 seconds. Place dipped sausages on parchment lined baking sheet. Whisk together egg and 1 Tbsp water. Brush on dipped sausages. Sprinkle tops with coarse sea salt.